Infabode is positioning itself as an information hub for the global real estate market. In an interview with ACROSS, Founder and CEO Matt Partridge explains how the European shopping center industry benefits from the platform. ACROSS: How does Infabode work? MATT PARTRIDGE: Infabode is an information platform for the global real estate market. We are changing the way in which industry research and insights are collected and shared among professionals. Before Infabode, if you wanted to know about investment in the London office market, for example, you would search on Google. This is time consuming and relies on clicking through a number of company websites, with a large amount of information and data potentially being missed. With Infabode, you only need one login and you can access industry research and information from hundreds of the leading global real estate companies. Users can sign up for free at www.infabode.com and choose the sectors that they’re interested in. They are then kept informed of any new information released by the hundreds of partnering companies. We are increasing the reach of the content for those producing information on global sectors, while saving those accessing it precious time by customizing our one-stop, online solution. ACROSS: What special tools and features does Infabode offer for the retail real estate industry? PARTRIDGE: Instant access to retail information, tailored to your interests. Infabode covers the retail property sector across all major global regions. We don’t believe any other provider has so much freely available data. All of this information is accessible from one platform, using one login. But we didn’t want to solve one problem and cause information overload in the process, so we broke the real estate industry down into subsectors that users could subscribe to. For example, the UK retail market breaks down into high street retail, shopping centers, retail markets by city, out-of-town retail, supermarkets, and retail warehouses. 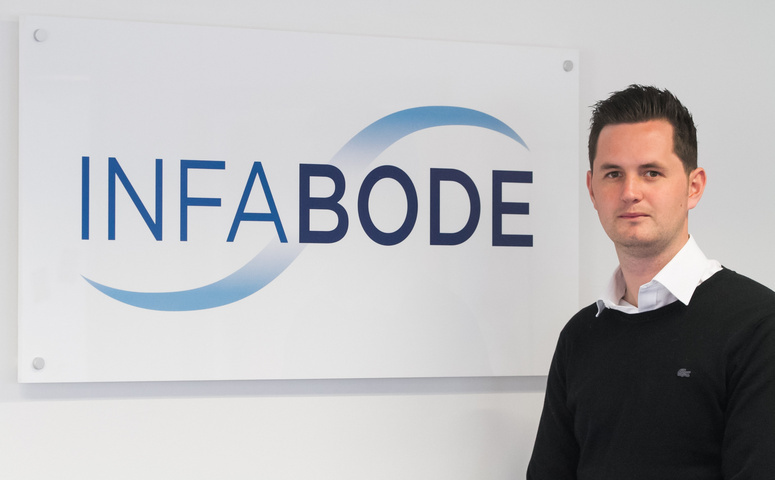 Infabode then keeps our members informed of any new information released on their sectors of interest and they can also search through our database of historic information for specific terms. ACROSS: How can European retail real estate experts profit from this platform? PARTRIDGE: Infabode is a platform where experts can share their knowledge and views on the market while also being able to access a database of over 150,000 pages of information. Infabode aims also to work as a social network. We are currently building features that will help professionals connect and do business with each other. ACROSS: Again with reference to European retail real estate: What relevance will Infabode have for this industry in, say, five years? PARTRIDGE: We think Infabode will become the “go to” place for the European retail real estate sector over the next five years. Infabode isn’t trying to create the answers—we produce no content ourselves—but is instead building a platform that will connect professionals with relevant third-party information and vice versa by connecting those third-party providers with industry professionals. Without giving too much away, looking through Google for industry information will become a thing of the past and professionals will start their search for all their industry needs on the Infabode platform.